Cat Ba Eco-Lodge (formerly Suoi Goi Resort) in Halong Bay is your ticket to unlocking the regions world famous natural beauty, incredible geology and diverse biodiversity. Our Eco-Lodge was created in 2010 to cater to International visitors who want to comfortably relax while experiencing the incredible natural offerings of Halong Bay. 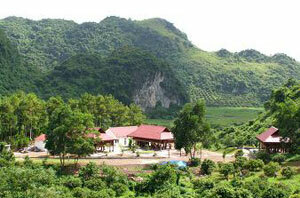 Cat Ba Eco-Lodge is nestled in dramatic forested hills 13 km from Cat Ba Town. (Information on arriving and getting around.) We have a warm, friendly, Vietnamese staff and our restaurant proudly serves some of the best Vietnamese and International cuisine on the island. Even if you do not stay at our hotel you are still invited to stop by for a memorable lunch at our acclaimed restaurant. In the hotel's common areas you will find our restaurant and our full service bar and lounge. In the lounge computers are available with free, fast, reliable Internet. Scattered around the 7 hectare property you will find our garden, fruit trees and hidden hammocks at your disposal. We also offer free cooking classes for those interested. There are marked walking trails of different intensities leaving from our lodge's front door. A self-guided walking tours explain the area's natural features including the unusual karst landscape that makes Halong Bay so famously beautiful and a UNESECO World Heritage Site. Several beaches (including our gorgeous private beach) are within 15 minutes on bicycle. Many guests like to discover a new beach or panoramic mountain top everyday of their stay. Thanks to many dining-room, big and small, that can serve over 300 guests with Asia and European cuisines and experienced chefs and cooks and a lot of fresh aqua-products (such as sea fishes of different kinds, blue large-size mussels, oysters...) and wild animals (such as goats, grouses...), prepared locally or traditionally, which will surely make tourists satisfied. Its Rooftop Garden and Panorama Bar, lying on the 9th floor of the Hotel with over 100 seats, are ideal places for birthday parties and open-air barbecues. Here, tourists can stay alone or sit with friends to play video games, listen to music and enjoy well-known cocktail and get an aerial panoramic view over the whole island.